Likud's Elkin warns a unity government would be an 'historic mistake,' as Zionist Union would pull coalition leftward to justify itself. Immigration and Absorption Minister Ze'ev Elkin (Likud) on Friday strongly rejected the talk of Zionist Union joining the coalition in a unity government, warning that such a move would pull the government to the left and endanger Likud's future. "In recent days there has been an animated conversation in the Labor party (of Zionist Union) on whether to join our government or not due to the desperate efforts of (Zionist Union chair Yitzhak) 'Buji' Herzog to convince his party members to join the government at almost any cost," said Elkin. Regarding that cost, Herzog on Thursday revealed his conditions for joining a unity government, even as his party MKs rejected the prospect of uniting with Likud. 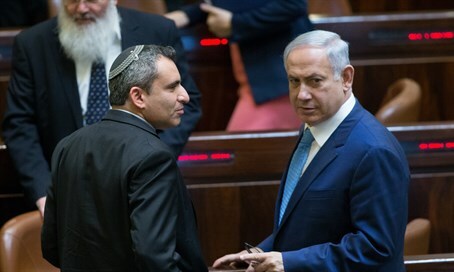 Elkin said Likud members must hold a serious talk about the proposal, adding, "my personal opinion on this matter is very sharp and clear: in these circumstances I definitely oppose having the Labor party join the government." "This process will seriously harm the public confidence in Israeli politics," he explained. "The two parties, both us and Labor, went to these elections (in early 2015) while clarifying the unfathomable differences in positions between us, and promising countless times that a unity government would not arise." The Likud minister emphasized that "a breach of these obligations and an artificial union between my comrades and myself with (Arab MK) Zuhair Bahloul who defends the terrorists, and post-Zionists like Yossi Yonah and Stav Shaffir and their comrades, will seriously harm the confidence of the public in the entire political system." Elkin said that by joining the government, the Zionist Union party would be destroyed as would be the leadership of Herzog. "For MKs in the Labor party, if it joins the government, it will be worthwhile to struggle not over the roles of junior minister or deputy minister for nonsense affairs in our government, but rather to check the possibility of integrating into the tail-end of the (Knesset) list with (Yesh Atid head) Yair Lapid or in Meretz, of course under the presumption that they want to see the next Knesset not just from the Knesset TV channel." Not only would the merger harm Zionist Union, but it would also cause Likud to lose in the coming elections according to the minister. He said that among other things, the anticipated resignation of Jewish Home members from the coalition would form a strong opposition against Likud from the political right in the next elections. "There is no doubt that a loss of the support from within the nationalist camp, both electorally and politically after the elections, is liable to cause us and together with us the nationalist camp to lose the coming elections," he predicted. "Internal factionalization and world wars within the nationalist camp always ended badly," Elkin warned, saying the process would endanger Likud's future "for momentary benefit, which is imagined in my opinion." Elkin anticipated that a unity government would not be stable, saying, "from the chaos currently reigning in the Labor faction it is clear that only some of the members of the faction see themselves as obligated to coalition discipline in return for the roles they will receive." "The attempt shows that only those with roles in the government will remember that they're part of the coalition, and that's only at the start. With time the number of those feeling obligated will lessen, and the ministers and deputy ministers will try to have it both ways and be a hostile opposition as a wolf in sheep's clothing within the government." "With Jewish Home leaving the coalition it will start to disintegrate very quickly, and it is likely that the government won't be able to maintain its composition for more than one year," he emphasized. Explaining why Zionist Union joining the coalition would pull it leftward, he said Herzog "and his friends in the government will at all times try to restore the confidence of the left and justify post factum their sitting in the government." "Therefore every day they will try to pull us to the left and will demand a payment 'to Molekh': more and more leftist achievements, otherwise they will cry and threaten that they won't be able to stay inside (the government) and keep their comrades (inside as well)." He recalled a similar situation between 2009 and 2012 when Ehud Barak of Labor sat in the government with Likud. "For all these reasons and many others, I don't believe in the process of a unity government and think that it is a great mistake, not only for the Labor party but also for Likud." While noting that the current narrow 61 MK coalition which has the smallest majority possible makes it difficult to operate, he said it was preferable to not remaining loyal to the voters and to ideology. "I also call on all my faction members to show responsibility and to take on themselves more obligation and discipline, otherwise the historic responsibility of the mistake of a unity government and its damages will fall on their shoulders as well," he concluded.